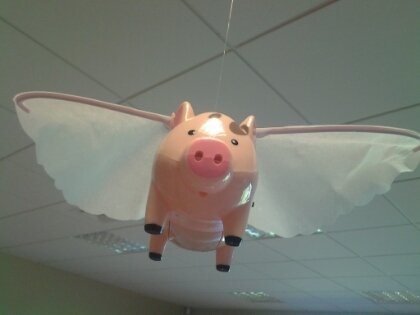 This is flying pig, very much in vogue among physics teachers because it acts as a conical pendulum. The flapping wings seem to give it enough forward thrust to eliminate any deceleration from friction, so it flies level. Even better, it seems that the circular path is a stable equilibrium, as a non-circular orbit quickly decays to circular. I’d like to attach a small LED and take a long-exposure photograph from underneath to see the path it takes. This entry was posted in Uncategorized and tagged conical pendulum, flying pig, physics, practical on September 5, 2014 by Danny. I think that the aspect of modeling which excites me the most is the practical. The idea is brilliant: once students have mastered a model, you set up a situation where they use the model (usually in a multi-step way) to make a prediction about the behavior of a real phenomenon. 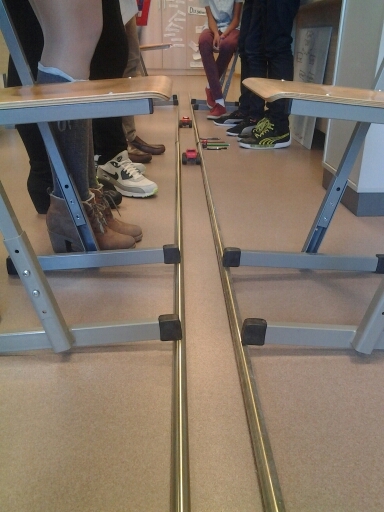 Our first practical was to predict the location of the collision between two buggies on a straight track. 1. Some students have trouble getting started, and it can be difficult to point them in the right direction. 2. I am not sure how to differentiate a practical — there is a certain basic amount of physics that needs to be done. 3. Unlike the paradigm labs where I can carefully choose apparatus that will give good results, I cannot guarantee that a lucky guess here won’t occasionally beat a careful calculation that is off because of random error. 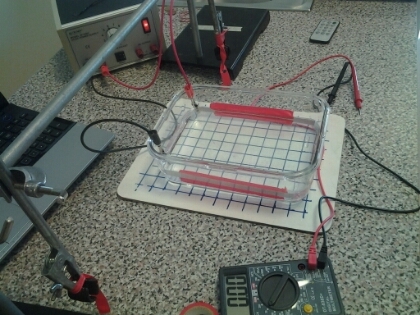 I also did the electric potential mapping experiment today. I think it is a very clever way to understand electric fields. This entry was posted in Uncategorized and tagged buggies, electric field, modphys, practical on September 4, 2014 by Danny.